8/28: Over Under Sideways Down on LuxuriaMusic.com returns LIVE! 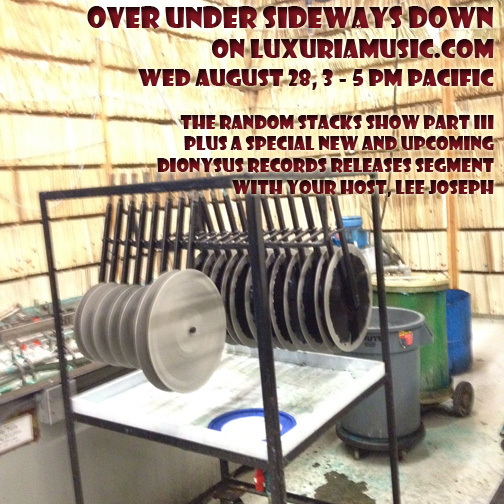 This coming Wednesday, I’ll be returning to the LuxuriaMusicstudios, recovered from Tiki Oasis and Surf Guitar 101, for my first live Over Under Sideways Down in over a month, bringing you Part III of “Music from the Random Stacks of Records in my Living Room.” The show feature a variety of new acquisitions plus gems pulled from my music library and for whatever reason, not yet filed away, including a mixture of music from loud to lite to ludicrous – from rock to raga to ridiculous. I will also be doing a segment of tracks from recent as well as upcoming, as-of-yet Dionysus Records releases with tracks by Creepxotica, The Satelliters, The Gears, Ruby Dee and The Snakehandlers, The Skip Heller Combo, The Dukes of Hamburg, Replikas, Jason Lee and the R.I.P. Tides and more!